To reach the level of a perennial top-ten program, a school must have a combination of high-quality athletes and a coaching staff who brings them together as a team. Ole Miss fans have seen what head coach Hugh Freeze and his staff are capable of, as we are only four short years removed from a 2-10 season. The road back got a big boost with the arrival of Freeze’s 2013 recruiting class which was rated No. 5 by ESPN. In that class were Robert Nkemdiche, Laremy Tunsil, Laquon Treadwell, Antonio Conner and Evan Engram. The 2016 class already has commitments from WR DeKaylin Metcalf, DT Benito Jones, RB Denzel Mitchell, TE Octavious Cooley, TE Gabe Angel, RB Justin Conner, WR Daniel Crowell and OL Eli Johnson. For those keeping score, there are four 4-star players and one 5-star player in the above list of 2016 commits. All signs were already pointing to the 2016 recruiting class rivaling that of the heralded class of 2013. 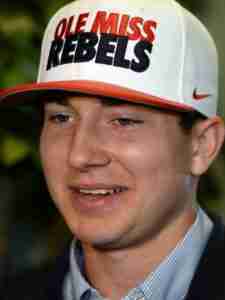 Yesterday, however, the stars aligned, making the Rebels poised to contend for the top-rated recruiting class of 2016. What happened yesterday? 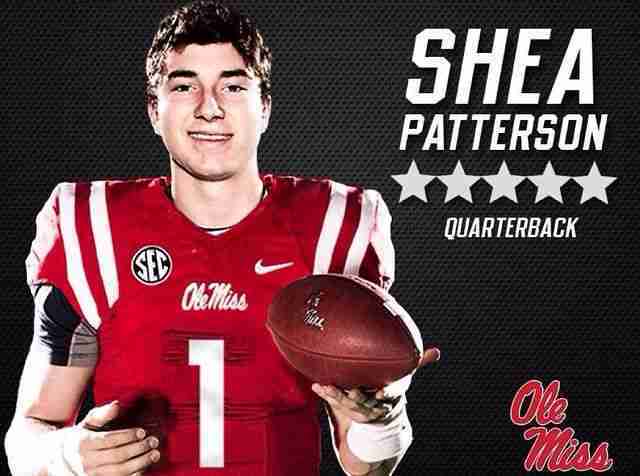 Five-star QB Shea Patterson out of Shreveport Calvary Baptist Academy announced his decision to attend Ole Miss. Patterson is rated the top quarterback prospect by Scout.com. The 6-foot-2, 190-pound junior passed for 38 touchdowns and 2,428 yards last season. He completed 64.8% of his passes, while only throwing three interceptions. His touchdown-to-interception numbers for his high school career are a fantastic 72-to-7. Shea Patterson is an athletic quarterback who has the skills to beat you with his arm or his legs. He is a perfect fit for the Ole Miss offensive scheme. And while this young man has the potential to do amazing things on the field for the Rebels, he is already having an impact on the program before he ever takes a snap. His commitment was news on ESPN, and you can bet that other top-ranked recruits around the country took note. The Rebels have early commitments from seven of ESPN’s Top 300 Juniors, including four in the top 47. A few other great players to keep your eyes on include: OT Willie Allen (ranked No. 29); WR Mykel Jones (ranked No. 77); and, RB/LB Devin White (ranked No. 178). Don’t be surprised to see two–if not all three–join Patterson in Oxford. Allen and White are both good friends of Patterson, and they have expressed interest in playing collegiate ball together. WR Jordan Duncan (No. 163), S Lamarques Thomas (No. 214), DT Raekwon Davis (No. 224 and currently an Alabama commit), Athlete Nero Nelson (No. 239), WR A.J. Brown (No. 279), DE Jeffrey Simmons, DE Drelan Porter, OL Greg Eiland, CB Nigel Knott, and S Jaquelle Green (No. 145). Ole Miss should be back to its full allotment of 25 available scholarships for 2016 National Signing Day, plus we could have some additional December signees to go along with Shea Patterson. For those who say Patterson’s commitment is only verbal and point out how we lost two highly-rated verbal commits in the days leading up to the 2015 National Signing Day, you are correct. It is true that until the player signs on the dotted line, it is not official. However, it must be noted that quarterbacks of the level of Patterson typically commit early and do not flip. Shea Patterson will play his senior season for Calvary Baptist Academy and plans to graduate early, in December, 2015. He has been working for quite some time to recruit other highly ranted prospects to join him at the next level. So make no mistake; yesterday was a BIG day for our Rebels and Coach Freeze. The journey to the top continues. It’s not a question of if we get there—only when! Rex’s attachment to Ole Miss goes back to when his parent’s named him. It seems there was an Ole Miss football player that his dad liked his name so from day one he was destined to have Ole Miss as part of his life. He attended Ole Miss graduating in December, 1974 with a BBA majoring in Accountancy. While he’s lived in three states and a number of cities since then he’s always followed the Rebels in all sports. In 2013 Rex took a big step when he started a podcast, RebelRex, where he fulfilled a dream–talking with Ole Miss athletes, current and past, from all sports.